After a couple of lovely days in Bergen (seriously, so lovely), we packed up our things and headed out on another mini-road trip to get to our next destination: Stavanger. It was only about four hours away by car. The thing about Norway is, there's water everywhere. Anytime you wish to travel to another city, I swear you cannot get there without having to take a ferry (or three). But the ferry rides were lovely and it was so cool to see how well ferry travel is incorporated into the public transportation system of Norway. It's just so different than the way things are done in Utah (obviously). Stavanger was smaller than Bergen and had a totally different vibe, but it was just as cool to visit. 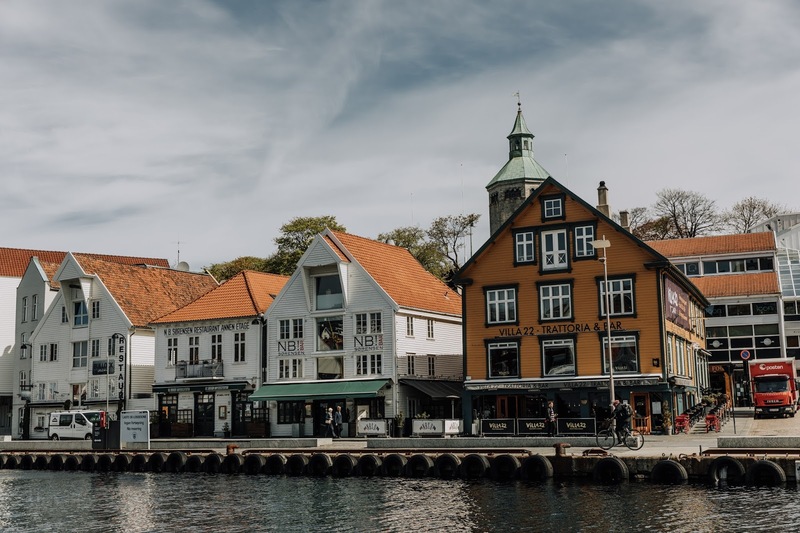 There is a section of town known as "Old Stavanger" where a whole neighborhood of the most adorable, white houses are clumped together near the water. 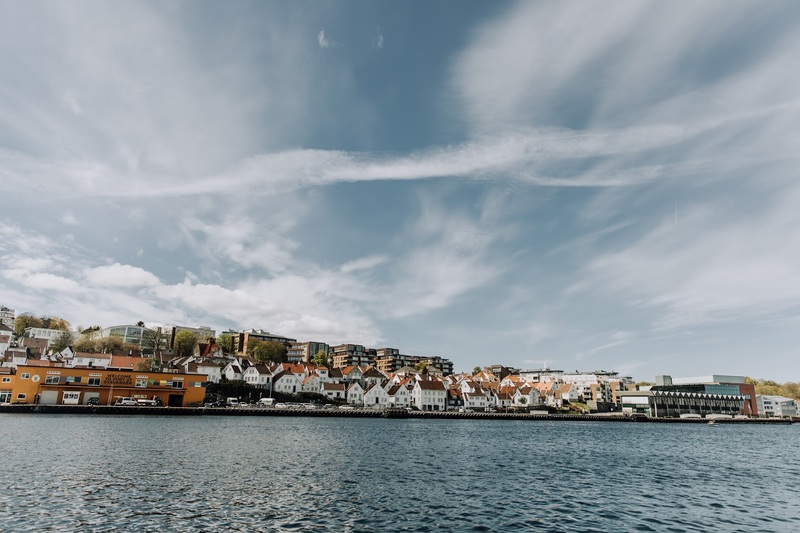 We spent a lot of our time in Stavanger just walking the streets looking for fun things to do, good food to eat, and pretty views. We had originally planned on hiking Preikestolen (otherwise known as Pulpit Rock) during our time here, but with random pregnancy things going on, we ended up deciding that it probably wasn't the best thing fro me to do-- but if you're ever in the area, DO IT. Right in the center of town there is a gorgeous cathedral that dates all the way back to the 12th century. The architecture on the inside was absolutely gorgeous. Taylor pointed out several little details that looked rather viking-esque, which was incredibly cool (we are both pretty obsessed with the viking history of Norway). It's such a surreal feeling to stand in a building that dates back to hundreds and hundreds of years ago. I can't help myself but to dream of the people who built it and to imagine all of the people who have wandered in and out of those walls since the day it was created. It's almost as if the walls can whisper and tell stories of all the people and things it has experienced. I am always so intrigued by the history of various cities around the world. Sometimes I wish I could go back in time and be a fly on the wall just so I could experience things how they used to be. I guess I'll just have to keep reading books and watching movies and allow them to be my makeshift "time machines" that will transport me to different times. We spent some time wandering in and out of various shops that lined the cobblestone streets. This street, in particular, caught my attention. Each shop that was painted in it's own variety of bright and happy colors. It felt as if we had walked into a real life version of a Disney movie. Or Diagon Alley, whichever you prefer. There was the cutest little book store and an adorable coffee shop cluttered with people-- those two shops in particular caught my attention, but every story put on a good show. The windows all contained the loveliest assortment of knick-knacks placed ever so carefully in their detailed displays. I wanted to buy everything... so I figured it was probably safest to buy nothing and just enjoy being in the middle of it all. We got a chance to visit the well-known tourist attraction, Sverd i Fjell (sword in rock). It commemorates a famous battle (the battle of Hafrsfjord-- try pronouncing that, I dare you) that united all of Norway under one crown. The monument was pretty spectacular-- it is nestled beside a fjord, which acts as the most magnificent backdrop for the large, stone swords planted into the ground. My favorite thing about monuments is learning about the events or people for which they were built. We couldn't resist the chance to set up a tripod and sneak a couple of photos of the two of us standing on the rocky shoreline (seeing as the only other photos we had of ourselves from this trip were selfies. Don't get me wrong, selfies are fine, but they're just not the same). Baby Gunther is finally starting to make an appearance... although, my baby bump looks more like a food baby than it does an actual baby. I'll take what I can get, I suppose. Sixteen weeks and goin' strong! Taylor was snapping photos of me showin' off the little bump when suddenly a group of people started to watch me and I began to feel extremely uncomfortable (especially considering the whole food baby vs baby bump thing haha). I immediately busted into a fit of laughter and proceeded to cover my belly whilst retreating quickly to the car, my giggling husband following not too far behind. Being pregnant is probably the most awkward thing I've ever done. I'm embracing it all one day at a time. 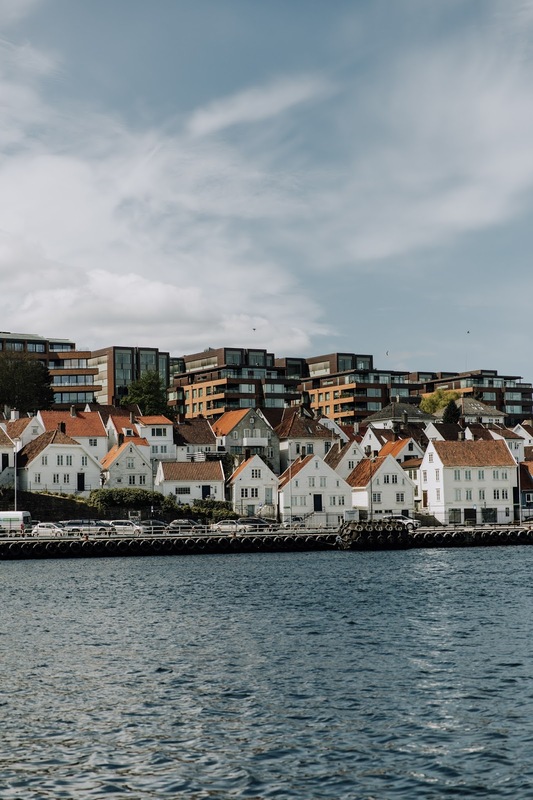 The rest of our time in Stavanger was spent visiting old friends and families that Taylor came to know and love while he was serving as a missionary in the area. My heart was so full as I watched him interacting with these people. I always wondered what it would be like to witness Taylor as a full-time missionary. I'd picture him interacting with imaginary people and smile to myself as he was serving in Norway and I was serving in Korea. But seeing him in real life with these real people was almost too much for my heart to handle. The way he loved them and the way they loved him made me so happy that I thought I was going to burst at the seams. Missionary work is something that I hold so dearly to my heart. Getting to see glimpses of Taylor and his mission is something that I will always hold dear to my heart. I think that's what has made me decide that Norway isn't going to be a place that we "went to that one time." It's going to become a place that is woven into our hearts and our lives so intricately that it will become a part of who we are. This isn't the only time we will make this journey-- it's the first of many Norway trips to come. And that thought makes me really happy. We visited the church where my gradmother was baptized back in the1800s. Very moving experience! That's such an incredible experience to have! I'm sure that was a moment you'll hold dear to your heart forever. I grew up in Stavanger (10 years). I haven't had the opportunty to go back but it is on my bucket list. Fun to read your post!